Google Chrome protects its user preferences using a hashing (HMAC SHA256) mechanism. However, there’s a way to bypass it and it’s quite used by malware in the wild. We will first study the way Chrome protects its user settings (Secure Preferences), then we will see how it can be defeated by rewriting the needed hashes. In the end, we will study a malware that uses that technique and we will see how RogueKiller Anti-malware can defeat it using that technique as well. Secure Preferences implements (as its name suggests) some securing mechanism to ensure no malware comes to modify the file manually. This is achieved by hashing some of the json nodes with a custom hashing protocol, based on HMAC SHA256, each time a setting is modified by Google Chrome. At startup, Chrome then verifies all the hashes and if something doesn’t match it asks for a restore. We can see a few interesting fields regarding startup urls and homepage (highlighted). For each field, we have a corresponding entry in the “protection.macs” node. If some program modifies (manually) one of the settings above it will need to update the corresponding hash in the macs, as well as the “super_mac” entry. The seed is unique to a machine where Chrome is installed (or per Chrome version?). It’s stored in Chrome’s installation path (C:\Program Files (x86)\Google\Chrome\Application\ChromeVersion\resources.pak). This format is quite known now, and well explained here. All you need to do is to look for the first resource with a length of 64. Please note that the Json content needs to be modified a little bit by removing the empty arrays and objects, and that the “<" character (for some reason) needs to be replaced by its unicode hexadecimal representation. 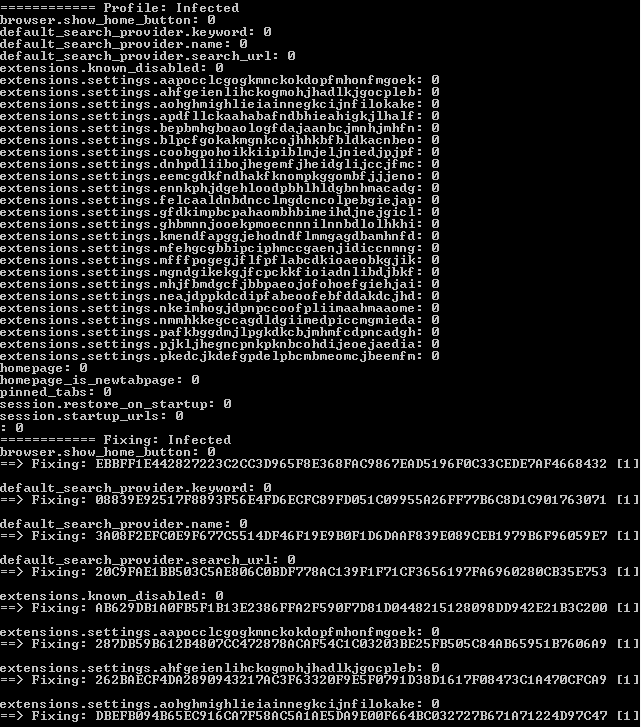 Find below the code (shortened) we use to hash a json node, given its path and required machine ID and seed. It’s using a HMAC 256 method from cryptopp, but you can use any method you like (works with OpenSSL). 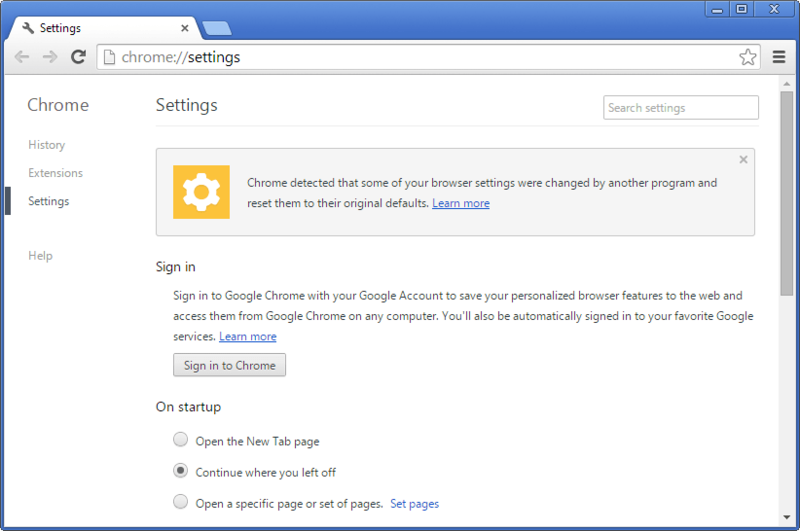 Some malware are using that trick to bypass Chrome protection and install themselves in the user settings. 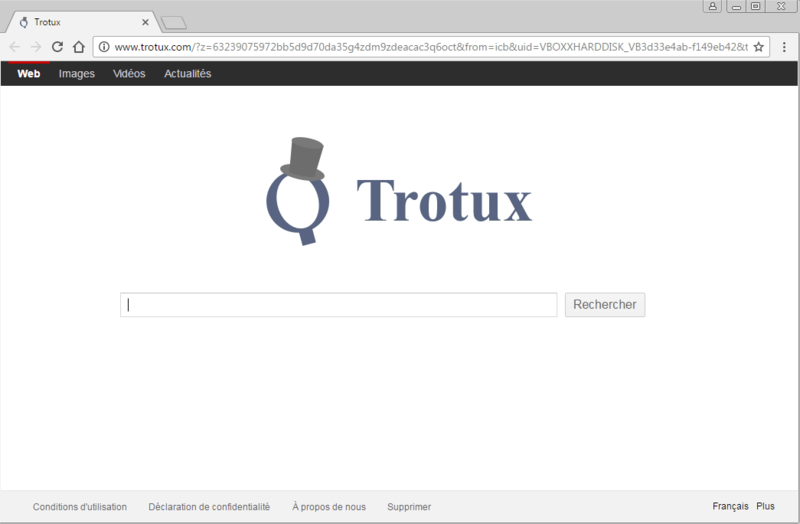 This the case of the adware Trotux/Elex, which replaces the homepage, startup urls and the search engine. The infected secure preferences given as example comes from this malware. 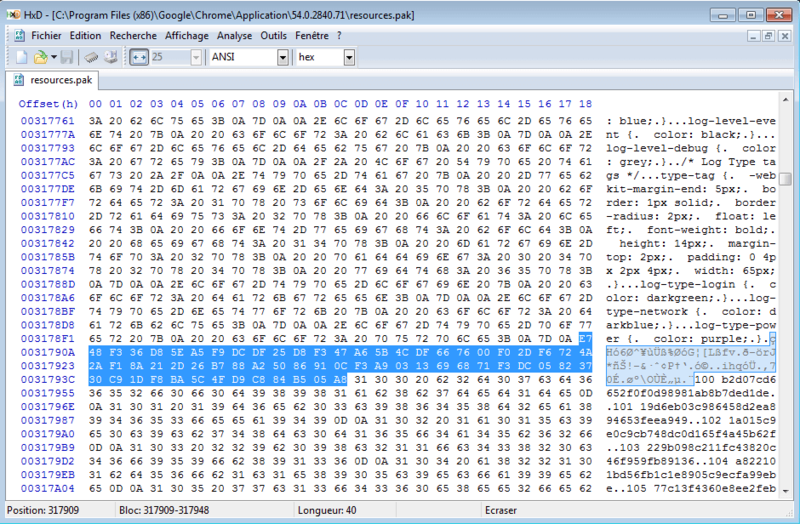 RogueKiller is able to remove it, as well as cleanup the browser. 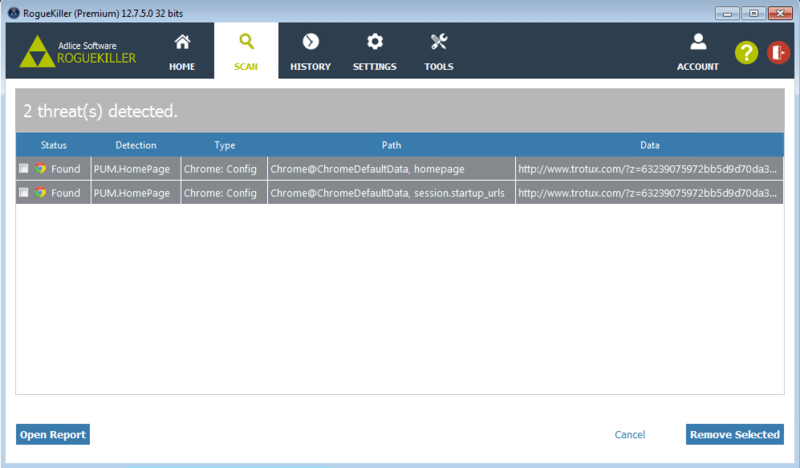 Starting with version 12.8.0, RogueKiller is able to detect infectious Chrome settings, and remove them. It’s also able to update the protection.macs settings so that the cleanup will be totally transparent for the Chrome browser, and it won’t restore the infected setup. It’s really important, because any setting restored without updating the HMAC hashes will result in a restoration of the infectious state by the Chrome browser iteself.